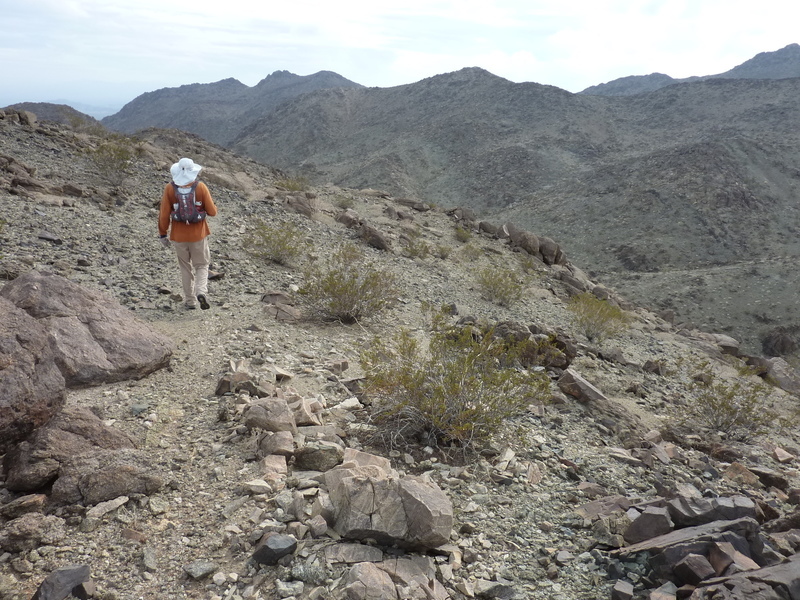 I slept off the side of Eagle Mountain Rd, a short distance north of Interstate 10. Karl had joined me in this remote corner outside Joshua Tree NP sometime in the night, having driven from Santa Cruz the previous afternoon. Clouds hung low over the predawn sky as I went over to greet him in the morning. He was here for my annual birthday desert trip and today we were going to tackle one of several P1Ks in the park's Eagle Mountains. Extending over 25mi in length, the range contains 5 summits with more than 1,000ft of prominence, none of them easy to get to. Mission BM is the northernmost one, located just outside the park boundary, north of the massive Eagle Mountain Mine. The iron mine shut down in the 1980s leaving behind a ghost town that was briefly used for a low-risk prison before it too fell quiet. But all is not still in this desert area - in addition to the Colorado aqueduct which flows along the east and southern edges of the range (with several pump stations to get it up and over Chiriaco Summit), there is a massive solar farm, recently installed, found in the desert plains just east of the mine. Our first effort to reach a reasonable starting point was up paved Eagle Mtn Rd. Seven miles north of Interstate 10 we were stopped unexpectedly by a gate at the Eagle Mtn Pumping Plant managed by the Metropolitan Water District. Though there was no sentry, there was a phone available with signs indicating that visitors needed to check in first. This seemed perfectly convenient as Karl got on the phone to speak to the operator. Unfortunately, things did not go well from here. Despite Karl's pleasant demeanor, the person on the other end of the phone acted offended that we might call, reiterating what we already knew - the road beyond was private property - and there was no way we could get through. Apparently we didn't fit their narrow definition of "visitor" which is really someone who has been thoroughly vetted beforehand and unlikely to include a couple of desert rats looking to simply drive through. All was not lost, however. After hanging up with our unseen MWD operator, we consulted our maps and phones and beta notes that we might have checked with first, finding that there is another route, paved Kaiser Rd that could get us to where we wanted to go. Back out to Interstate 10 we went, east a short distance to Desert Center and SR177, then Kaiser Rd. Things were looking up. We followed Kaiser Rd almost to its conclusion, turning right where it crosses the aqueduct (the water is underground here, easy to miss the turnoff) to follow the paved aqueduct access road. We wanted to get out to the end of one of the dikes west of the silt trap as depicted on the 7.5' topo map, but found our way blocked by a gate. Backtracking, we found another route up onto the dike which proved brushy and a bit challenging for the Element. In the end it saved us only 0.4mi, so parking along the aqueduct road might have been a smarter idea. Our starting point was situated just north of the mine. 80-foot high tailings of gray rock line the south side of the wash we started up. We noted a number of huge tires lying in the wash here, almost like they were part of an errosion abatement program. More likely, we surmised, some of the mine workers had some fun trundling the worn-out tires from the top of the tailings to see how far they could roll. We followed the canyon for nearly two miles, enjoying some easy scrambling in places, finding the route interesting but not technically difficult or brushy. We found the first of several tarantulas here, momentarily diverting our attention. Mating season must be upon them to get them from their burrows, or perhaps its home was washed out from the recent rains. We eventually climbed out of this main canyon, traversing NW across some slopes into another smaller drainage which we then followed nearly to our summit. The landscape here is a confusing jumble of drainages, some flowing north into Pinto Basin, others leading east from the direction we'd come. The GPS was a big help in getting us to the right summit without wasted effort. In a little over three hours we had found our way to the summit, and despite the high perch we found ourselves on, the views were almost entirely lacking. Low and medium level clouds mixed with an almost oppressive haze of water vapor that gave the mountains a somewhat sinister feel. There was no blue sky to be found anywhere and visibility was limited. We found the 1960 benchmark and a register left by Vitz in 1988. Three other parties had signed in since that time, including Carey and Adrian most recently in 2013. We spent only a short time at the summit before the chill of the cold desert air suggested we get moving again. We had no other peak on the day's agenda and it wasn't yet noon, so we had no particularly need to hurry our return. We talked about various options we might take to add some interest, eventually settling on a descent down an alternate drainage to the northeast. Knowing that we had to be careful not to follow it down into Pinto Basin (that would make for a very long return around the NE corner of the range), we periodically adjusted our route by climbing over one low rise or another into an adjacent drainage that took us closer to our original route but avoided the deeper main canyon we'd ascended. We found some use trails to take advantage of, what looked to be old mining trails created back in the day. Our meandering took us by several old prospect sites, some with colorful rocks suggesting copper ore, but nothing that looks to have been seriously exploited. Karl grabbed a sample as a souvenier at one site that had interesting aquarmarine colors in various shades. It was almost 2p by the time we got back to the car at the edge of the mine. We were happy to see that no one had come out to check up on us or ticket the vehicle for being on the dike. After returning to the aqueduct road, we had driven only a short distance before we came upon a Riverside County Sheriff parked on the road. The officer was outside the car, holding a rock in one hand, looking at us. We slowed to stop as it seemed he wanted to talk to us. We were concerned at this point, guessing maybe someone had called the sheriff to report trespassing, though we didn't really think we'd done anything illegal. After rolling down the window, we were greated with something to the effect of, "So what are you gentlemen doing out here?" We gave him the boring truth - just out to climb a nearby mountain - in a few boring sentences. It became clear that he hadn't been out to check on us and was in fact a bit surprised by our sudden appearance from a direction he didn't expect. So I asked him in return, "So what are *you* doing out here? Is this part of your territory?" with a smile to let him know I was just making conversation. Here he broke into his own smile with, "Well, you caught me taking a piss and I noticed this interesting rock." He held up the dark greenish rock, not particularly unusual, that he had found, to show us. At this point I realized he was just out here goofing off and was embarassed to be found out. We hadn't actually seen him taking a piss but he assumed we had. He told us about other unusual rocks he'd found out here (clearly he was a rock hound a little embarassed to tell us about it) and then I said, "Hey, we found a cool one, too!" as Karl produced the small chunk of bright blue-green rock he'd picked up. "You didn't pick that up in the park, did you?" he asked with a smile that Karl didn't quite see. As Karl started to explain we'd picked it up on BLM land he cut us short with a chuckle and, "Oh, I don't care. I'm just kidding you." He examined it, commented about how to polish it and told us he'd also found some rocks with fools' gold embedded that looked almost like the real thing. I got his name, Michel, from his badge and before our five minute conversation was done we were great friends. We left him with his green rock as we motored back to the highway.